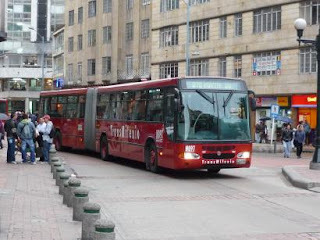 Bogota has an integrated public transportation system Transmilenio (http://www.transmilenio.gov.co/WebSite/English_Default.aspx), which forms a backbone of transportation there. It was launched around the turn of the milenium and its specific is that it uses combination of buses as vehicles with secluded corridors and metro-like stations and varied station coverage by different lines on the same route. The whole system is divided into various sections which have different code letter (A,B,C,D,E,F,G,H,J) and a different color. This makes orientation easier. The stations in a particular section have the ascribed color, where as buses announce their destination by combination of letter and number. The letter informs passanger as to the destination sector of the vehicle, where as the number denotes the station coverage. The bus maz be for instance D70. The varied station coverage is one of the intriquing aspects of the system. There are many different services going to one destination, and therefor many different numbers followind one letter in the bus identification. The advantage of this is that besides one service, that stops on every station of the route, there are other "express" services that stop only at some stations, thus arriving in much shorter time. There are timetables and served station diagrams at all stations so that passenger can choose the appropriate service.